Bradford & Bigelow delivers complex, time-sensitive, mission-critical, zero-defect projects. The goal of G7 is to provide visually consistent, repeatable color between the approved proof and the printed sheet. Our G7 Master Certification provides you the peace of mind the proofs and printed sheets will almost be an exact match. Our focus has always been on being Best-in-Class not biggest-in-class. As an ISO 9001:2015 Certified company, we have 150 talented and highly trained team members working on the same complex projects year after year. These chain-of-custody certifications promote responsible purchasing of raw materials and endorse sustainable forest management that addresses deforestation while increasing direct benefits to the environment. We are Bradford & Bigelow and we approach print differently. B&B produces complex, time-sensitive, mission-critical, zero-defect projects at quality and service levels exceeding our customers’ expectations. If you have a project that requires these high standards, please call us today. Is B&B right for you? Meet with one of our knowledgeable business development managers to learn how B&B can help your organization! Bradford & Bigelow’s fleet of Timson presses comprises one of the most efficient and responsive platforms in the industry. We specialize in the 8.5×11 trim size and lightweight papers. Additionally, with all bindery services performed internally, our lead times are the best in the industry! We enhance our conventional platform with a robust in-house digital and inkjet book factory complete with inline finishing — further expediting delivery and helping our clients to minimize back orders, reduce inventory obsolescence, and maximize profitability. We don’t just sell print. We build relationships and add value to your supply chain. Bradford & Bigelow’s primary markets are educational, healthcare, secure testing, financial, and industrial catalogs — all markets requiring 8.5×11 product, lighter papers, zero defects, and rapid response times. B&B also provides printing expertise to various governmental agencies where zero defects are a requirement, not a request. With our expanded inkjet and digital book factory, B&B is now offering four-color process and variable data printing within our vertical markets. 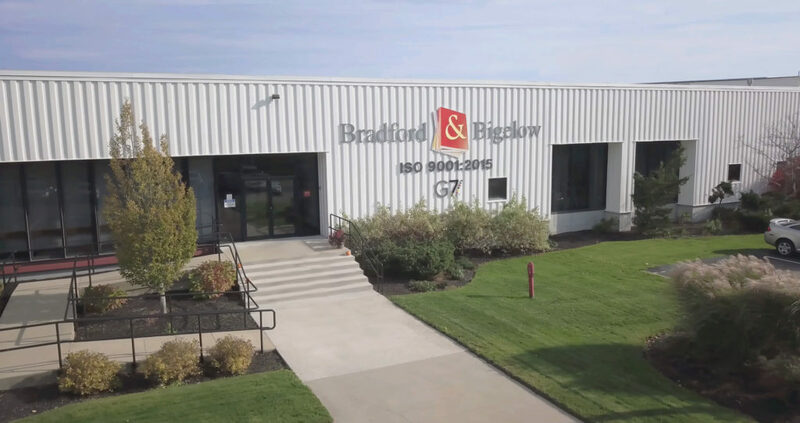 Bradford & Bigelow has invested in the best green technology available to provide our team members, clients, and planet earth with the most environmentally friendly print platform in North America. Our Timson presses produce zero toxic VOC emissions by utilizing more expensive UV inks and drying technology. These inks also greatly reduce energy consumption by eliminating costly and wasteful ovens and chillers. On the inkjet side, B&B utilizes the most advanced dye-based inks, which require minimal heat and eliminate the need for the massive ovens that legacy pigment-based inkjet machines require. At B&B, “environmental stewardship” is an everyday practice and investment — not just a slogan! Within our markets, Bradford & Bigelow is the quality leader. A market focus on one trim size, 8.5×11, UV inks that eliminate marking and web growth, the open head Timson design that prevents gusseting, and optically scanned bar coded signatures – all combine to create a superior manufacturing platform. Our Print Platform, coupled with our ISO 9001 and G7 trained workforce, enables B&B to consistently produce a superior product and service experience that more diversified and non-certified suppliers cannot match. I’d also like to take this opportunity to let you know how extremely helpful you have been, working with me on our current project. We had a series of missteps at the last minute and had to make several changes to the final proofs – and each request was met with great professionalism, cheerfulness, and helpfulness. Great customer service! Bradford & Bigelow has been a great resource. The service finished product quality and on-time delivery have all been first class. A strong relationship between our companies isn’t just because B&B provides printed products, but they provide solutions and professionalism.